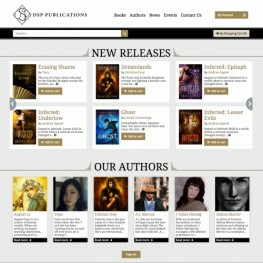 DSP Publications launched our new website and online store today. Visitors will be able to browse wide range of reader-favorite genres, including fantasy, historical, horror, mystery, paranormal, science fiction, and spiritual fiction. They can purchase books, find out about about new and coming releases, learn more about our authors and hear about our latest news and upcoming events. DSP Publications is a boutique imprint producing quality fiction that pushes the envelope to present immersive, unique, and unforgettable reading experiences. We choose stories that beg to be told, tales that depart from mainstream concepts to create fantastic and compelling journeys of the mind worth your time and effort. We are "Off the Beaten Path. Worth the Journey." Please visit us at www.dsppublications.com and learn more about us.